The University of Chicago and Aramark have somewhat of a love-hate dynamic. It began with the admission of Joseph Neubauer (M.B.A. ’65; see bottom of Article) to the business school and continues today, with a contracted relationship between the company and UChicago Dining that has spanned more than 25 years of meal plans, dining halls, and health inspections. This year, however, the relationship could come to an end with the expiration of the contract in June 2016. Aramark is a worldwide company, with operations in 21 countries and more than 270,000 employees. It focuses on food service, facilities management, and uniforms, though their primary service is refreshments—including 1 billion cups of coffee each year. Its clients range from 2,200 educational institutions to 500 correctional facilities to 160 oil rigs, mines, and other remote locations, including 16 underground cafeterias in the world’s largest underground copper mine. 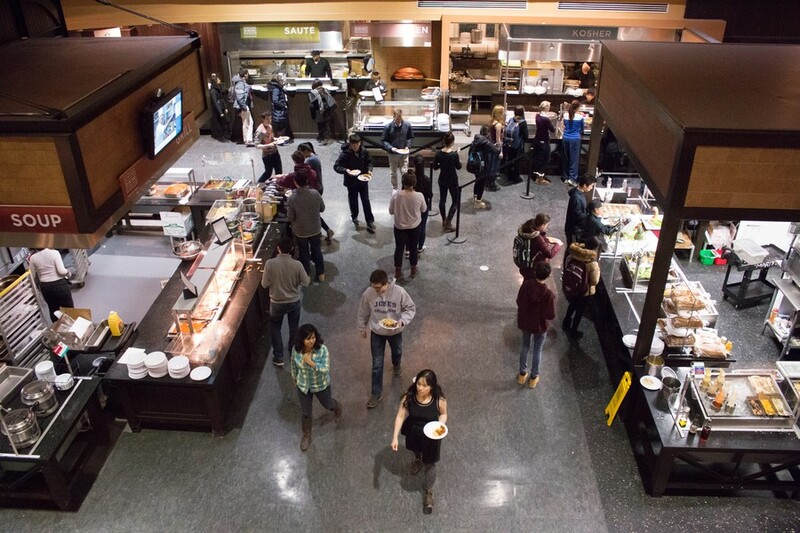 UChicago Dining, the office that manages the dining halls, campus cafes, and meal plans throughout the University, has been one of these clients since 1989. This official relationship between Aramark and the University of Chicago began when the University decided to switch from internally-run dining operations, typically called self-operation, to a contracted private firm. This decision meant the University would no longer be in charge of hiring or training employees, nor procuring or preparing food. This challenge has persisted through UChicago Dining’s 27 years of external operations. When Aramark came on board in 1989, UChicago Dining was responsible for two dining halls: Burton-Judson and Pierce. When Bartlett opened as a dining hall in 2001, it became one of a plethora of meal plan options specific to each hall. For example, in 2006 Pierce hosted an all-you-can-eat meal plan while Bartlett offered a la carte options for Flex dollars with exclusive dinner points going to students in Max Palevsky, Snell-Hitchcock, and Stony Island. Students chose to eat at certain dining halls based on their selected meal plan. In 2011, UChicago Dining decided to simplify the meal plan options by introducing the Global Dining Initiative, a campus-wide evaluation of dining services looking at “what dining meant on campus,” according to Mason. Focus groups, surveys, town halls, and analyses over the course of a year culminated in the rebranding of flex dollars to the current Maroon dollar system, expanding their usage to campus cafes and other locations, increasing environmental sustainability within dining, and creating four distinct meal plans. These included the Apartment with limited meal swipes and Maroon dollars, Phoenix with more meal swipes and Maroon dollars, the off-campus option with ten meal swipes, and the original unlimited meal plan. Both the Phoenix and the unlimited plans cost $1,667 per quarter, but at the time Mason explained that the increased number of retail options for the Phoenix plan gave it an equal value to the unlimited. The University wanted to create meal plan options that appealed to students but were also simple enough to understand—the goal is to build up the dining community rather than chasing students out because of expensive or confusing meal plans, after all. In addition, this ensures that there will be enough revenue from meal plans to finance the future operation of the dining halls. As meal plan options and dining halls changed, one thing stayed constant: UChicago’s contract with Aramark. In 1996 the contract was renewed after what Mason called “a pretty competitive bidding process” for another seven years. However, according to Mason, several one-year extensions followed because the effects of the recession in 2008 delayed the construction and eventual opening of Arley D. Cathey Dining Commons and Renee Granville-Grossman Residential Commons in 2009. Aramark was certainly a hot topic on campus, but not in the way Engineering Solutions had intended. In 2004, the Burton-Judson dining hall closed twice because of citations from the City of Chicago’s Department of Health’s Food Protection Program. According to a Maroon article from February 24, 2004, approximately 500 students were without access to their dining hall when Burton-Judson Dining Commons—which would be renovated and reincarnated as Cathey—was closed for a weekend because health inspectors discovered mouse feces and carcasses on glue traps in the kitchen, citing the dining hall for multiple violations. Things seemed to return to normal, until Bartlett and Cathey failed back-to-back health department inspections in May 2010. Inspectors in Bartlett reported more than 50 fruit flies in the dishwashing area and near the drinks station as well as a leak under a handwashing sink at the pizza and pasta station. They also cited general unsanitary practices such as rust on the interior of the ice machine, though no evidence of rodents was discovered. Fruit flies were also located in Cathey near the garbage disposal, dishwashing area, and basement dry storage room. However, in 2012 Aramark came under fire again when all three dining halls failed inspections multiple times, including two re-inspection failures. In March Bartlett was cited for violations including 40–50 small flies resting on walls, countertops, prep tables, and flying throughout the area; 25 pounds of cheese refrigerated at improper temperatures; and broken wall tiles, sink tiles, and doors that were non-rodent-proof. An additional inspection in September netted violations including the dish machine in the kosher station not on or operating properly, 50–55 mice droppings, 10 live flies, food potentially contaminated by mice droppings, and missing sneeze guards. In a November 2012 inspection of Cathey, citations included 75-100 mice droppings scattered in all prep areas, 40-45 small flies in the dishwashing and other areas, and missing ceiling tiles. When inspectors revisited nine days later, they still noted evidence of rodents and insects, including 30 mice droppings and 70-75 small flies. The dining hall was forced to close for a number of days and Aramark reimbursed students from those dining halls with a collective $130,000 extra Maroon dollars. Also in November, Pierce failed an inspection based on citations that ranged from extreme clutter in the mop sink closet to floor tiles needing new grout to 20 pounds of cooked rice, sour cream, and sliced tomatoes stored at improper temperatures. The next spring—after Cathey and Bartlett each failed one more inspection in April for a total of eight failures in three years—UChicago Dining announced an external review process with National Everclean Services, a third-party firm that has performed over 40,000 food safety and sanitation audits for food retailers in over 10,000 facilities since 1998. A statement on the UChicago Dining website explained that National Everclean Services would conduct a thorough examination of all dining facilities on campus to identify the sources of the recent problems and provide training to dining employees, though UChicago Dining has not released the findings of the review. Neither Bartlett nor Cathey have failed an inspection since the spring of that year (Pierce closed in 2013). Their most recent inspections were April 4, 2015 and June 23, 2015, respectively. Also in 2015, the University of Chicago Medical Center renewed its own food service contract with Aramark. UChicago Dining’s current contract with Aramark will expire on June 30 of this year. The office is currently undergoing a substantive process to review contract proposals by three out of seven companies invited by UChicago Dining to submit them. Sodexo, Bon Appetit, and Aramark were also the only companies who accepted the invitation. On February 23 and 24, representatives from each of the companies will visit UChicago for interviews. Six students from the Campus Dining Advisory Board will be able to sit in during the interviews and ask questions after reviewing their entire proposals, according to Mason. Then, Mason and other UChicago Dining officials plan to visit campuses where these providers operate, do reference checks, and speak to their counterparts at the other colleges’ dining offices. The entire review team of 26 stakeholders in this process includes managers from cafes near campus, representatives from other UChicago departments such as Facilities Services, and other colleagues. The ultimate decision, however, is left up to Vice President of Campus and Student Life Karen Warren Coleman, who will choose a food service provider based on the recommendation made by Mason, the staff of UChicago Dining, and the rest of the review team. As the current provider, Aramark has a lengthy history with the University already. A son to German parents who fled Kristallnacht, Joseph Neubauer immigrated by himself to the U.S. at age 14, having learned a few English words from classic Western movies. He earned his undergraduate degree from Tufts University while waiting tables and running a late-night snack delivery service out of his fraternity house. He started his relationship with the University of Chicago by earning his M.B.A. degree in 1965 on a full scholarship through the business school. In 1979 Neubauer joined the global hospitality company Aramark as an executive vice president and was elected president in 1981. He had ascended to CEO by 1983 and chairman of the Aramark board by 1984. He retired from his positions as the CEO and chairman of Aramark in 2012 and 2015, respectively. Within eight years of becoming chairman of the company, he was also on the Board of Trustees for the University of Chicago. When he and his wife wed in 1996 they asked that gifts be donated to UChicago—and then matched those gifts themselves. The same year he stepped down as Aramark’s CEO, he was elected vice chair of the UChicago Board of Trustees and has served as full chairman since 2015. Neubauer is also currently chairing the University’s record-setting $4.5 billion fundraising campaign. Through the Neubauer Family Foundation, he has donated more than $61 million to the University of Chicago. In a 2011 interview at Widener University—one of the few times Neubauer has been interviewed on the record—he explained his sense of responsibility as a leader both in his company and on the UChicago board of trustees.